No matter how you choose to give, your gift helps our Jaspers succeed. Thanks to the generous alumni, friends, and benefactors who continue to support Manhattan College, the next generation of Jaspers will be able to achieve a quality education. Because tuition alone does not cover the cost of a Manhattan College education, it is our goal to aggregate resources which enable the College to fulfill its mission as a Lasallian Catholic institution and help nurture the well-rounded student. There are a number of ways to contribute, and each gift echoes St. John Baptist de La Salle's vision of helping deserving students achieve an education that is rooted in tradition while looking to the future. Gifts via checks or credit/debit cards are the most valuable form of support for Manhattan College. Because these kinds of gifts make cash immediately available, they offer the College the flexibility to meet our most pressing needs. Or, download and mail in the gift form. Have a continuing impact by joining our monthly Cornerstone Guild giving program. Eliminate reminder notices by signing up for our automatic monthly giving program (electronic funds transfer). It's that easy! With automatic giving, there is no check writing, no postage, and no possibility of lost checks. By helping reduce administrative costs, more of your gift will support Manhattan College activities. Monthly giving also provides the College with a consistent cash flow, which helps in budgeting the College's valuable resources. Your gift may be pledged and spread over several months. Donors may change their donation or cancel enrollment in the automatic monthly giving program at any time by contacting the Development office. For more information on this program, or to enroll, call us at 718-862-7582 or email giving@manhattan.edu. Gifts of stock, securities and mutual funds can benefit both you and Manhattan College. These gifts can help you diversify your assets and minimize capital gains taxes. Contrary to popular belief, gifts of closely held stock can create the same tax benefits as shares that are publicly traded. Maintain the stock certificate(s) in your name. DO NOT change the name to Manhattan College prior to your broker's making the electronic transfer. 2. 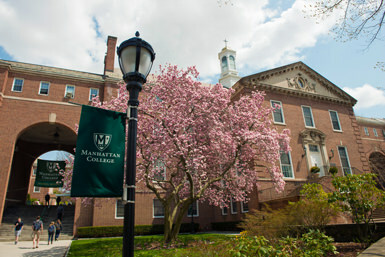 The Manhattan College account number to receive electronic transfers is 85669816. The Vanguard DTC number is 0062. For tax purposes, your gift will be valued as of the date when the transfer is received electronically into the College's account. The value of your gift will be the average of the high and low values on the day of receipt, multiplied by the number of shares donated. Gifts are tax deductible for federal income tax purposes to the extent permitted by law. What's better than a generous gift to Manhattan College? A gift that's twice as generous, thanks to a third party's matching gift program! Many companies offer employees and their spouses - and even retirees - a matching gift benefit that could double or even triple your gift. When making a gift to Manhattan College, please consider taking advantage of your (or your spouse's) corporate match. Companies have various methods by which you can submit your matching gift request: online forms, automated phone systems or a paper form that you submit to Manhattan College. Contact your company's human resources office or check their website to find out what your options are. The Planned Giving office can help you develop a gift plan that will achieve your charitable objectives as well as fulfill your financial goals. Planned gifts help you maximize your giving potential and make the most of your charitable dollars. Additionally, planned giving can offer you financial benefits including tax savings and increased income. Visit the planned giving website for more information about how to make a planned gift. Because of our employees' generous gifts of time, treasure, and talent, Manhattan College students continue to benefit from abundant opportunities to learn, grow, and excel. Please consider extending your service by making a tax-deductible gift through payroll deduction to further help our deserving young men and women. Your participation will also strengthen Manhattan College's ability to leverage additional institutional support. Donors may change their donation or cancel enrollment in the payroll deduction giving program at any time by contacting the Development office. For more information on this program, or to enroll today, call (718) 862-7275 or email giving@manhattan.edu. Every gift is an important contribution to provide our students with the brightest future possible.